For fast and easy shade anywhere, the Quik Shade GO series has you covered! The Quik Shade GO Hybrid Compact 7.5-Foot x 7.5-Foot Backpack Canopy is a lightweight recreational shelter that assembles in less than a minute, folds down to less than 1 cubic foot, and only weighs 14 pounds. The UV-resistant top is Aluminex-backed, providing 99% UV protection from the sun's harmful rays. It's the highest outdoor fabric UV protection available! The slanted leg design provides additional stability, with patented Quik Latch push/pull sliders and pushpin leg extenders designed for ease of use. The 6-foot x 6-foot canopy top and half panel wall provide a total of 36 square feet of shade for up to 4 people - enough for the whole family to comfortably take shelter! This canopy has an open cathedral ceiling for more headroom with a peak height of 5 feet 10 inches and an eave clearance of 4 feet 5 inches. Take it anywhere in the durable, polyester backpack bag to all of your outdoor activities - camping, the beach, tailgating, or just hanging out in your own backyard! Includes canopy frame, canopy top, half panel wall, and backpack bag; 30 day limited warranty. 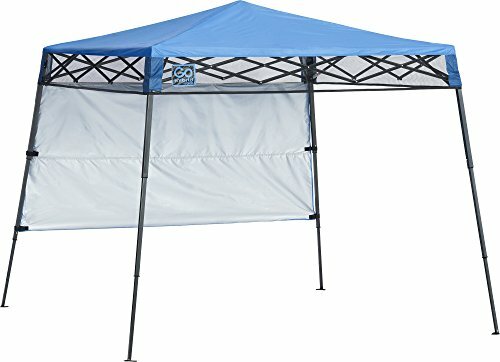 This canopy measures 7x7 ft. at the base, and provides 36 sqft. of shade with a 6x6 ft. fabric top. Lever tab activated pushpins offer 1 height position and allow for peak height of 5 ft. 10 in. and eave clearance of 4 ft. 5 in.